Southampton striker Rickie Lambert has warned his team-mates that they are now in a relegation dog-fight after their recent Premier League winless run. Saints, who host Manchester City on Saturday, have gone four league games without victory and are now just three points above the bottom three. "We are not blind, we realise we are in a relegation dog-fight right now," Lambert told BBC Radio Solent. "At the minute we are in a fight and we need to open up the gap even more." 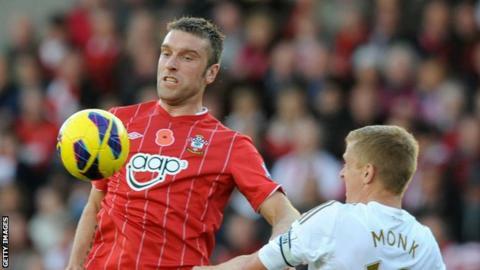 Lambert, who could score his 100th Saints goal at the weekend, says the mood in the squad is good despite recent results. And he says achieving his landmark goal against the Premier League champions would be the perfect way to reach a century. But the 30-year-old admits that points are more important at this stage of the season. "It would be nice come Saturday evening to have got my 100th goal and three points," he said. "But I'm not trying to make any big deal out of it, I'm just trying to get there as fast as I can. Obviously if it helps us get a point or win that is the most important thing. "If the performances were not as good then it wouldn't be as buoyant as it is. "But the performances have been good and there is a lot of excitement. We are enjoying our football and we believe the points are going to come."